A delicious acorn squash risotto that is vegan and gluten-free. Looking for a perfect fall side dish? Or a vegetarian knock-your-socks-off bowl of creamy goodness? Risotto might fit the bill. This is one of my all-time recipe favorites. 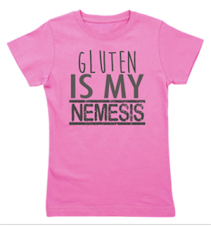 In fact, it was the first dish I turned to eight years ago when I discovered I had to live gluten-free. Way back then (insert hazy slow-mo flashback) I would add freshly grated Parmesan to the cooked risotto. Shaved Reggiano, to be exact. But these casein-free dairy-free days I enjoy this risotto strictly vegan. No cheese. And guess what? I don't feel deprived. Seriously. The flavors hold their own without the whole moo cow cheesy thing. In fact, this risotto is so creamy-good and comforting I only think one thing as I taste bite after velvety bite: How could anything so simple taste so unbelievably good? Well, that, and, Who the heck needs cheese or butter, anyway? 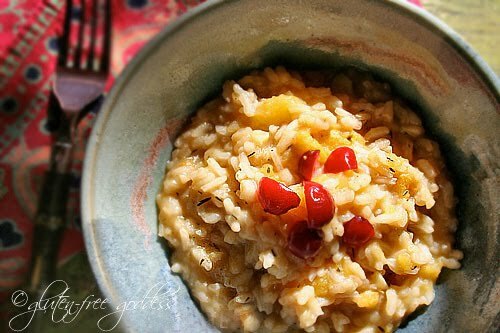 The trick to a tasty risotto- with its signature texture- is to stir it during cooking. No cheating in a rice cooker. No covering it and setting it on low heat, praying to the Risotto Gods, hoping it will produce a tender-yet-firm-enough bite boiling away in it's sad, ignored little pot. You need to tend these pearly grains. Coax them. Sweet talk them. It's all about foreplay. Risotto needs attention to bloom properly. So that means a commitment on your part. But it's only a twenty-two minute commitment. You can handle that, right? I guarantee, it's worth it. Risotto is my favorite comfort food. This autumn-into-winter flavored rice dish is an elegant vegetarian offering that is gluten-free and dairy-free. Make a vegan happy this holiday season. Serve this. Score some points. First- roast the acorn squash. Roast the acorn squash by placing the two halves cut side up in a baking dish; add about two inches of hot water into the bottom of the dish. Bake for about 30 minutes, or until the squash is fork tender. Heat the broth in a separate sauce pan, and keep it warm. In a heavy medium saucepan, heat the olive oil on medium heat, and sauté the onion and garlic for 3 minutes. Add the curry, nutmeg, and uncooked Arborio rice and stir well, until the rice is coated. Stir and cook for about 3-5 minutes. Add the wine and stir for a minute or two. Pour in 1 cup of the hot broth, and bring to a simmer. Reduce heat and simmer uncovered, stirring frequently for 7-8 minutes. When the squash is done, remove it from the oven and using a spoon scoop out pieces and add them into the risotto- I like to do this along with the last cup of broth. Stir to combine. When the final cup of liquid is absorbed cover and set aside for a few moments before serving. Risotto likes to rest a bit. Warm up four serving bowls. 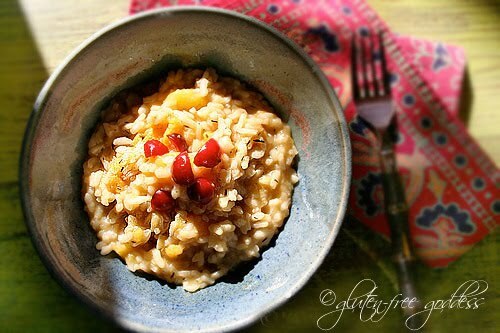 Spoon the risotto into the bowls, and garnish with some chopped toasted pecans, pine nuts or chopped fresh cranberries. All images & content are copyright protected, all rights reserved. Please do not use our images or content without prior permission. Thank you. Lots of water has churned under the bridge known as the Gluten-Free Goddess blog (born back in late 2005). And with that current, Dear Reader, many changes. My husband and I have moved more than half a dozen times (artists with empty nests like to explore), lived in six different states, ate dairy-free (for seven years) and baked vegan (no eggs) for five, shunning gluten 100% (still do, always will). This is to say, Dear Reader, that some recipes here might include eggs, milk and butter, while others might be totally GFDFEF (aka "still yummy while vegan"). I've baked all recipes both ways- so check recipe notes for substitutions. I've created roughly 400 recipes for you. 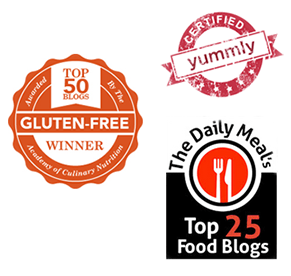 All are gluten-free, developed in my own humble kitchen(s). From Sweet Potato Black Bean Enchiladas to Apple Crisp I have focused on tasty, seasonal, family style cooking. The kind of food we actually cook here at Casa Allrich. Publisher and recipe developer Karina- aka Gluten-Free Goddess- discovered she was gluten intolerant in late 2001- after a decade of unseemly, classic celiac symptoms. She has been cooking and baking gluten-free ever since, serving up hundreds of original recipes on her popular food blog, launched in late fall 2005. 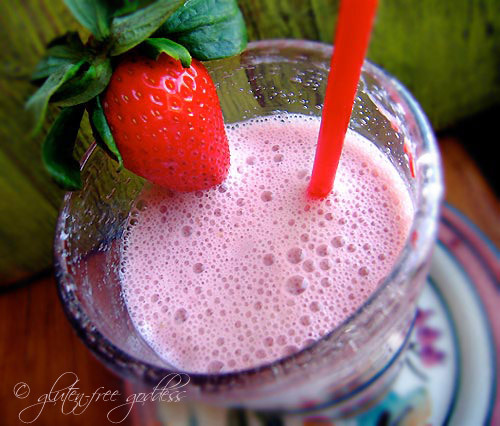 ©2005-2019 Gluten-Free Goddess Recipes is copyrighted by Karina Allrich. All rights reserved. Awesome Inc. theme. Powered by Blogger.